The Northern Caribbean University (NCU) Department of Communication Studies (DCS) on Wednesday April 9, 2014 continued its dominance in the media landscape when it held its first Animation workshop at the Hyacinth Chen School of Nursing in Mandeville. Although animation is a new phenomenon to Jamaica, there are individuals who are already making a gateway for Jamaica to be the next big thing in animation. NCU’s through the DCS is leading this charge as they seek to empower the creative minds of its students within this field. Students from all disciplines came out in their numbers to earn first-hand knowledge of this lucrative field of media. 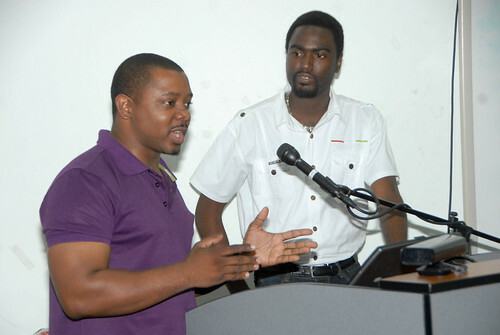 Kevin Jackson, who obtained his degree in Computer Science has in some way deviated and is now one of the few animators in Jamaica. He made the field of animation interesting by first declaring “to be an animator, you don’t necessarily has to be an artist.” This declaration relaxed the mood of the room as those in attendance wanted to hear more. The field of animations offers individuals the opportunity to become a: colourist, shader, producer, director, rigger, betweener, actor, lighting artist, story board artist, animator or even to become a generalist. Jackson who serves as the Public Relations Officer for the Jamaica Animation Nation Network edified the attendants that there is money in the field of animations, and as time progresses, it will become bigger. Currently the opportunity exists for individuals to freelance more than to work for a studio locally, as there are only three (3) animation studios locally. The market has a new crave for animated commercials, educational videos as well as the gaming industry which continues to soar. The pay scale tips favourably for an animator working at the entry level in North America is likely to make $20,000- $30,000 while the Indian animation market offers entry level animators an opportunity to earn $4,000. But the more high-end the job, the more high-end your pay will be. Stephen Williams who is an independent animator sought to hammer home the point that one must know their target audience before they venture to produce animations. If you have no clear target audience, you are clearly wasting your time. He further sought to provide those in attendance with the following tips as they aspire to animators. 2. Build a portfolio of all your work- it shows your capabilities. 7. Choose your style and work with it, as 2D is no better than 3D and vice versa. Know what you want to accomplish and work with the one you desire for the best outcome. 8. Lastly, provide your audience with an opportunity they don’t have every day. So always go beyond. The opportunity exists for individuals interested to log onto the Jamaican Animation Nation Network (JANN) or Jamaica Design Association (JDA). This can allow upcoming animators the chance to get their work out to the public.